Does this count as a sock? We could knit anything we wanted with the yarn but I didn’t want to do a plain square. On my desk I saw this lying around waiting to be put away and I thought that I’d give it a try. Isn’t that the cutest little sock? 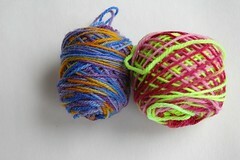 I love how it looks like the yarn is self striping at this size. Anything bigger and it would look a lot different. 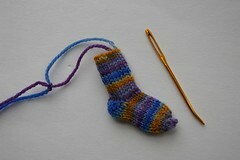 Sadly, it is just too small for the key chain sock blocker. I guess I will just have to try again! I love my little sock blocker key chain! It can change with your mood too! Such a little cutie! Can’t wait to see how the other color turns out. So cute! And where did you get the the sweet sock blocker keychain? If you wet it a bit do you think it will stretch out for the blocker? Out of curiosity, did you use the pattern that came with the little blocker? I ask because I purchased one of those from The Loopy Ewe and still have not knit it up yet. You wee sock is adorable! Adorable! Of course it counts as a sock. I love how it striped.